Protect your eyes from the sun and show off your love for all kinds of music with these stylish shades! These music note readers combine necessity with fun and fashion. Made with optical quality aspherical lenses. 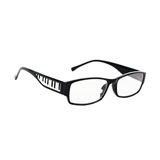 These reading glasses are the perfect mix of fashion, fun, and music. Music is "Risky Business" with music on the white arms and black frame these classically styled sunglasses are 400UV blocking both UVA/UVB. Acrylic frames and lenses. Music is "Risky Business" with music keys on the white arms and black frame these classically styled sunglasses are 400UV blocking both UVA/UVB. Acrylic frames and lenses. 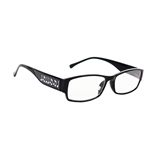 Great for everyday and anywhere use, these clear-frame reading glasses are accented with a subtle sheet music motif on the arms, and come in a coordinating padded sleeve. pocket or evening bag. Cardboard, 4" x 3 1/2". Protect your eyes from the sun and show off your love for the piano with these stylish shades! Large enough to handle most glasses and sunglasses, this sophisticated, satiny hardshell case comes with a matching microfiber cleaning cloth. Arriving in their own neoprene case, these reading glasses are made with optical quality aspherical lenses, spring hinges, and hand polished frames. Be a part of the unfolding drama when using our fully adjustable opera glasses that come with their own drawstring pouch.